So after eight months and lots of travel interruptions, live concerts [including a fantastic OMD gig – my favorite ever, in April], and the occasional off-OMD post to break up the logjam, we stand atop the summit of Mount OMD and behold the vista before us! What, prithee, is the Rock G.P.A. that 22 albums [some OMD off-branded] and 39 years bring to us? In spite of four 4.0 ranked albums, the end result here was a solid B- average, at 2.8. Slightly better than Simple Minds had achieved on the previous Rock G.P.A®, which also lasted into over 70 posts. I promise that this won’t happen again, unless I tackle acts like Bowie, Roxy and Foxx. In all honesty, after his death, I spent three months on Bowie without even discussing his albums in detail at all! 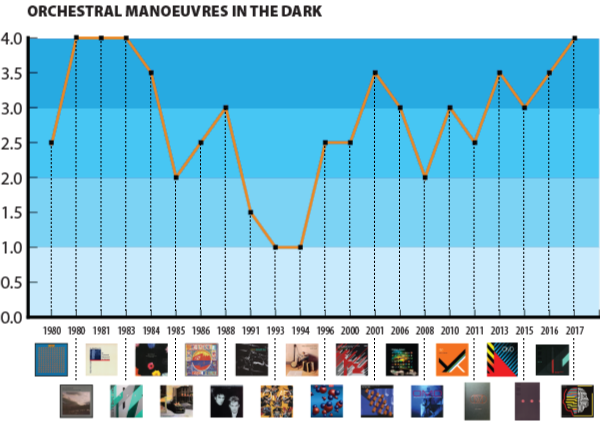 It looks like a pretty typical graph for a band of OMD’s heritage who have been around for that long. Most of my favorite bands have a severe dip in quality in the middle of their careers followed by slow, steady progress, one handhold at a time, onward and upward. If they are lucky. Then there’s Duran Duran who just seem psychotic. Fortunately, OMD were smart when they reformed. They admit to having enough income [at least the main two writers] from their hits to not absolutely need to be recording albums and touring. They got back together at first for the novelty of it [German TV was putting them up first class to have them lipsync to a song or two] and then reminding themselves what it was like to be a band again. They wisely avoided most of the pitfalls that befell them the first time. Having a degree of financial independence instead of debt to Virgin Records, surely aided their decision not to let their career run riot over them as it did in the mid-80s, when they were lashed to the album/tour/album annual treadmill. That forced activity sapped their youthful passions and interests in about 3-4 years, leaving them bereft of inspiration yet needing to produce product and grind it out like sausages. In the ten years that OMD have been reactivated, they have wisely released only three studio albums. They have also released four live albums; something they never troubled themselves with in their first or second phase. That’s about two more, really, than they should have supported, but at least three of them served to document special one off gigs and tours, so I understand the thinking. For two of them, I was certainly glad they made the effort. This entry was posted in Core Collection, Mid-80s Malaise, Rock GPA and tagged 2018, OMD, Rock G.P.A.. Bookmark the permalink. Bravo, Monk! I didn’t comment on any of these (many, many) GPA posts, but I enjoyed reading them. You mentioned Bowie, Roxy, and Foxx. The former and latter would be monumental tasks, but I think Roxy would be a reasonable challenge. The only thing harder than Foxx would be Bill Nelson! zoo – Hah! I thought of Bill Nelson when I was hastily typing that sentence, but I have my limits. And I reached them in 1992! I have just ONE of his hundreds of albums released since then. So I can guarantee that no Nelsonic Rock G.P.A. could ever happen. Well, Roxy with Ferry is still a big’un – 28 albums, not counting compilations. I will roll some comps into a Rock G.P.A. but reserve the right to ignore them just the same. I would be totally down for a Roxy//Ferry twofer. Tim – Give me a few years. Those first four albums are so significant that I would probably spend a full month just examining them. And of those four, the first two are of seismic significance! I still need to review the “Roxy Music” megabox. It’s definitely fabbo but I will have to do such a seminal album [only “The Velvet Underground With Nico” I would rank higher – sorry, Bowie] justice. That was just a fantastic travel up and down and up again through the career of such a significant band. The fact that ANY band can return to the studio on the ascent is remarkable. The fact that OMD did it is an affirmation to fans of 40 years. I greatly enjoyed reading the OMD GPA so many thanks, Monk. I certainly enjoyed OMD from 1980-1985. Saw them live 6-8 times during that period. After that, I lost interest and never came back. I did listen to the last 3 albums and even saw the POL tour. Left me cold. Except for Ghost Star. I think part of it is nostalgia and part of it was the use of soft synths. It all had a metallic edge which I could not get around. Next GPA.All the choices and so much effort. Surprise us! Fantastic read; looked forward to every post. Nice concise graphic overview as well (s/b based on your day job, eh?). Your ratings mirror my own save for Universal which I ranked much higher perhaps because Liberator was soo bad. As for Bill Nelson, I stopped collecting years ago as his stuff got harder and more expensive to find notwithstanding the fact that his recent stuff is download only. Great 80s stuff though. KeithC – When I first got “Universal,” I ranked it more highly, for the same reason. Also, if it was the last OMD album, at least Andy tried on it! The title track is still most impressive. So Nelson is finally downloads empowered? Thank goodness he’s no longer restrained by the limitations of physical CD pressings! That probably held him back for a good 30 years! Agreed; he’s been very prolific on Bandcamp in the last few years. Between him and Steve Kilbey, there is so much released on d/l that I very close to breaking my CD-only habits as I am missing so much stuff. KeithC – I still barely buy music on DL format. I’d better get over that otherwise I will never hear much going forward. Except that even DL’s days are numbered. We seem to be entering a hellish future of streaming and vinyl as the dominant formats!